For Newborn Baby Eyes Care : You must surely see the eyes of your newborn being watery or hanging. Family history of glaucoma or cataract can be seen in your infant eyes. Be sure that he does not blink his eyes more often. Take them to the newborn eye specialist, who can detect the neural problem by examining the eyes of the newborn. 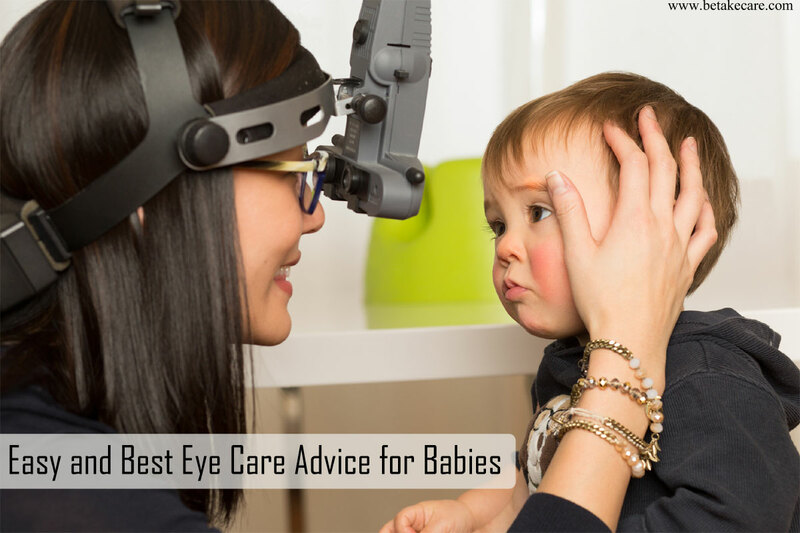 For Small Toddler Eyes Care : Check carefully with eye-catching eyes or late eyes. Focus on rotating the eyes with spinning objects. Take care if he rotates the eye without any reason. You can also find out through the rotating object that it sees them or is confused. If there is too much mud or normal light is unbearable, then immediately go to a doctor and check it. School Children Eyes Care : If the school child does not see the board or watches the television skew, then immediate attention is needed. If they look at copy or book more closely than usual, then you should find out about his vision. Sitting too close to television or falling in the night also exhibits eye problems. They reduce interest in the surroundings or stop studies. These situations should not be overlooked. Healthy Food for Healthy Eye : A balanced diet consisting of red and green leafy vegetables such as spinach, carrot, beetroot and yellow fruits, which include mango, papaya which is rich in carotene (containing Vitamin A) for children. Watching TV: In a well lit room, the TV should look at the distance of 3.5 meters or more. Use of Computer: Children should be encouraged to use them wisely so that the eyes do not get tired. The computer screen should be below the eye level. It gives full blink to the eyes, which can reduce the symptoms of dryness and fatigue of eyes. Therefore, children must blink their eyes and rest their eyes at fixed intervals. Light: Books should be read from 14 inches in the light coming from behind. Reduce playing games on electronic devices: Make sure they do not play games on the playing machines for a long time. Videos and pictures are also included in this. Regular intervals: Regular difference should be given for reading, working on computer and other such functions. They should have a habit of putting water shades on their eyes. Looking at things from a distance: At the time of their rest, they should see the objects far away. This will increase their viewing capacity further. Playing games of open spaces: Children should play sports in open grounds. This will make them exercise enough and pressure on sight will be reduced. Playing with the phone: The use of telephone should also be controlled due to their Lace Form Element and Resolve. Keep books away from the eyes: Children should keep books with their eyes at a distance of 40 centimeters. It is a good habit and it reduces the pressure on the eyes. If the child participates in a game, then he should use eyeglasses that protect his eyes. Use sun-ray glasses to protect eyes from chlorine and other chemicals while bathing. Allergic conjunctivitis is found in school children, measures to increase eye glow, children should refuse to eye to avoid this. Kajal can be harmful in the eyes of the newborn and washed with rose water. Using neat and young children very fast and unrivaled sports will disappoint them. They should be encouraged to study in adequate light places. Keep the screen of the game devices or computer away from the eyes, these screens should be at least 40 centimeters away. With the help of fasting eyes, adequate rest for the eyes and both of them will enhance your eyesight with proper sleep. If there is a problem or you should meet the eye specialist for regular screening. He will provide the right solution for you in the past.